Where did I come from before I was born? What if I’m dead already and just don’t know it? If I am, how will I know when it’s time to get up on Resurrection Day? Wake Me for the Resurrection is the right prescription for anyone in danger of sleeping in on the morning of the Resurrection. In their second collaborative effort, Salt Lake Tribune Columnist Robert Kirby and cartoonist Pat Bagley further explore the deeper meaning of life behind the Zion Curtain. Kirby’s wry observations on Mormonite behavior and Bagley’s revealing pen lay bare the ironies and perplexities of serving under the iron rod, proving once and for all that there is life after Sunday School — even if it’s still evolving. “This book is dedicated to anyone who has been forced to seriously consider the possibility that Larry, Moe and Curley were the Three Nephites.” With that kind of opening, you know this book will be a hilarious romp through Mormon culture. Author Robert Kirby and illustrator Pat Bagley both are award winners with the Salt Lake Tribune. I have been following them for years, and am pleased to confess Kirby’s columns and Pat’s cartoons crack me up, and also make me think. This endeavor was first published in 1996 by Buckaroo Books, and this second edition by Leicester Bay Books came out earlier this year. 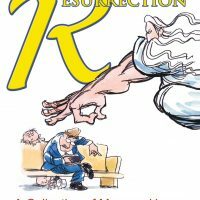 I am grateful to the current publisher for doing this, and encourage readers of this review to visit them at www.leicesterbaybooks.com for more interesting and fun titles. Mormons are often thought of as a rather dour lot, and there is some reason for people feeling that way. We sometimes come across as self-righteous, judgmental, and prudish. Guess what? We sometimes are. When we are, you can count on Kirby and Bagley to poke a hole in our stuffed shirts, and let some of the gas out. This collection of cartoons and articles does just that. Here is an example: One of Pat Bagley’s illustrations shows a man standing in front talking and gesturing. Most of the people in the congregation are either asleep or reading a book. One kid in the back is making a face like the guy in the famous painting, “The Scream.” There is a melting clock on the wall showing time flowing backwards. The caption reads, “Eternity: the Time it takes Bro. Snedeker to bear his Testimony . . .” I think there is a Bro. Snedeker (and a Sis. Snedeker) in every ward. I know there has been in every ward I have attended. The cartoon cracked me up, and is typical of those found in this collection. In addition to being a humorist and satirist, Robert Kirby is a philosopher of sorts. In the article titled “The Is No Damn in Ramadan,” Kirby concludes, “Right now, Muslims are observing Ramadan, a month-long period of turning away from earthly pleasures in order to concentrate on spiritual matters. They fast each day from dawn until dark, making this the equivalent of a really, really long Mormon Fast Sunday. Each night during Ramadan, Muslims gather at their mosque in Salt Lake City to pray. Ramadan will end around Feb. 20 with an all day fast. “Granted, there are only about 3,000 Muslims in Utah, but 1 out of 5 people in the world is Muslim. And since the world is getting to be a smaller place, it would do everyone in Utah some good if we got to know each other a little better. . . ” (11). If you are an active Mormon, less active Mormon, ex-Mormon, or have never been a Mormon, this book is for you. You will laugh (often out loud, and bordering on the hysterical), you will learn, and often be left to ponder. In short, buy this book (and the others in the series). It will be good for you. The KINDLE version is available for $5.99 by clickingHERE.